Teen and adult fans of All The Bright Places, Me and Earl and the Dying Girl, and Everything, Everything will adore this quirky story of coming-of-age, coming out, friendship, love...and agoraphobia. Sixteen-year-old Solomon is agoraphobic. He hasn't left the house in three years, which is fine by him. Ambitious Lisa desperately wants to get into the second-best psychology program for college (she's being realistic). But how can she prove she deserves a spot there? Determined to “fix” Sol, Lisa thrusts herself into his life, sitting through Star Trek marathons with him and introducing him to her charming boyfriend Clark. Soon, all three teens are far closer than they thought they'd be, and when their walls fall down, their friendships threaten to collapse, as well. 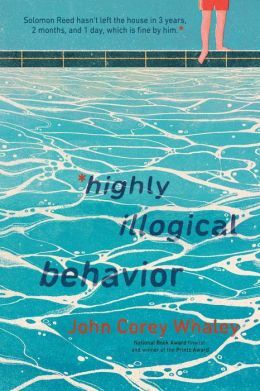 A hilarious and heartwarming coming-of-age perfect for readers of Matthew Quick and Rainbow Rowell, Highly Illogical Behavior showcases the different ways we hide ourselves from the world -- and how love, tragedy, and the need for connection may be the only things to bring us back into the light.